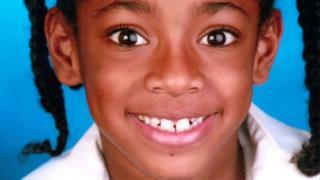 A mother whose nine-year-old daughter suffered a fatal asthma attack is calling for an investigation into whether air pollution contributed to her death. Ella Kissi-Debrah, who lived metres from the South Circular Road in south-east London, died in February 2013. Her mother Rosamund Kissi-Debrah says she was affected by pollution close to their home. Ella, a "bright" child who loved dancing, swimming and cycling, was diagnosed with asthma in October 2010 following a virus. On the day she died she had been at school as normal before suffering a seizure as she slept. Ms Kissi-Debrah, from Hither Green in Lewisham, told BBC Radio London: "At twelve thirty the coughing fit started and we called an ambulance, I suppose we had got quite used it it. But the attacks were horrific." "I'm not saying pollution is the be-all and end-all because it was incredibly complex, but both her and my son do get affected because of where we live." Ms Kissi-Debrah wants the attorney general to order a second inquest into Ella's death, or an independent inquiry into the effects of air pollution on children's health. She has been spurred on by research findings on pollution since her daughter's death and is concerned for her son Robert, aged nine, who also has asthma. Almost 10,000 Londoners die every year because of polluted air according to the latest medical research. The family is being represented by human rights lawyer Jocelyn Cockburn who says she was "shocked" that the issue of pollution was never been raised at the inquest and had not formed part of any medical assessments. "It's been three years since Ella's death and there still hasn't been an investigation into the impact of pollution," she said. "That puts the government potentially in breach of the human rights of the family." Figures from the British Lung Foundation suggest people who live in poorer London boroughs are up to twice as likely to die from lung diseases as people in wealthier areas. Mayor of London Sadiq Khan said: "My thoughts and prayers are with Ella and my condolences with her family. It's tragic. "The experts are saying one of the reasons for the increase in cases for asthma and bronchitis is because of our poor air and that's why I want to take action and I intend to take action."